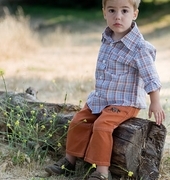 You'll love the rich colors and super soft organic fabric in these organic cotton cargo pants by Look Organics. These comfortable--yet durable--pants feature an elastic waist band, mock fly, and front and back patch pockets. 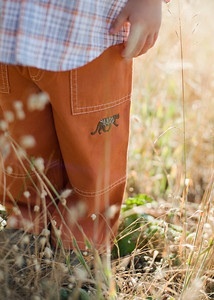 Our favorite detail is an adorable embroidered mountain lion embroidered on the left front pocket. So cute! Available in bark (dark brown) or brook (blue), both of which coordinate perfectly with Look Organics' Portugese plaid button-down shirt. Many parents have asked us to expand our line of boy's clothing. 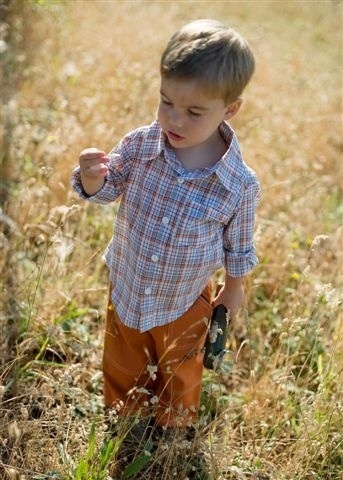 We were thrilled to find Look Organics' cargo pants and coordinating button-down shirt. The pants are boyish and durable, but they have neat clean lines and great details. And of course, they are 100% organic! 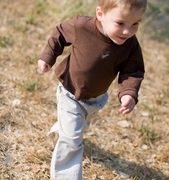 GOTS-Certified Organic Cotton: Look Organics' cargo pants are certified organic from seed to packaging. GOTS (Global Organic Textile Standard), a USDA Accredited Certifying Agent, certifies their organic cotton, from the fields through cleaning, carding, combing, spinning, weaving, and finishing. Chemical-Free Clothes: Look Organics uses dyes that are chemical-free, naturally reactive colors. These dyes are third party-certified to be free from heavy metals and halogens. Look Organics Founder Josie Jesser is originally from New York and has studied garment making in Boston, at the Austin School of Fashion Design, and at the Apparel Arts Design School in San Francisco. She launched her line of organic children's clothing in 2004, and five yeas later her company, Look Organics, continues to create unique, well-tailored children's garments out of the best organic fabrics available. Josie currently lives and works in Oakland, California, with her husband, daughter, and son. 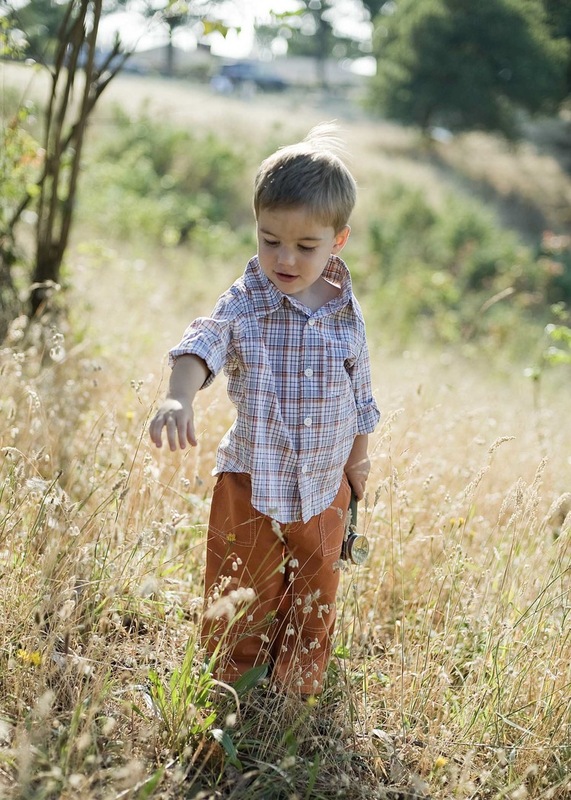 At UrthChild, we are thrilled to bring you Look Organics' stylish organic clothing for boys!